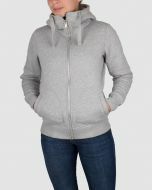 Lady hoodie made of 400g cotton and polyester blend. YKK metal zipper at front and two front pockets. A genuine quality blend of cotton and polyester in 400 grams makes the product your favorite for many years.